The sitcom “The Fresh Prince of Bel-Air” was created by Susan and Andy Borowitz. There were 6 seasons of around 25 episodes each, that is 148 episodes in all. The first episode was broadcast in September 1990 on NBC and the last one was aired in May 1996. Since then there have been of course many rebroadcasts and adaptations in different languages. Each season attracted at least 11 millions of viewers on the NBC; moreover the series won many awards like for instance a Kid’s Choice Award and it was also nominated for the Golden Globes and the Emmy Awards. Will (played by Will Smith) is the protagonist of the sitcom. He is rather hip and loves basketball, rap and girls, which are far away from his cousin Carlton’s hobbies and interests; a cause of frequent tensions. Will’s uncle is called Philip Banks (played by James Avery), he is a lawyer and a rather protective father. Many of the comic effects on the show are due to Will and Geoffrey’s jokes about his corpulence. His wife, Vivian Banks (played by Janet Hubert-Whitten and then by Daphne Maxwell Reid) is the sister of Will’s mother. At first she is depicted as an ambitious self-assured woman whereas she seems more like a caring and discreet homemaker afterwards. The couple has four children: first Hilary (played by Karyn Parsons) who is a stereotypical brainless doll whose only interests lie in shopping, money and fame. Her pretention and lacks of understanding create many comical situations. 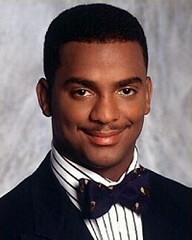 Then comes the snobbish Carlton (played by Alfonso Ribeiro) who has at first some difficulties to accept Will. Ashley is the third child (played by Tatyana M. Ali) who looks up to Will as a big brother. She is a mummy's girl and her father is overprotective to her and tries to control her life. The youngest child, Nicholas "Nicky" Andrew (played by Ross Bagley) was originally used to add comic effect and emotional punch to the show. 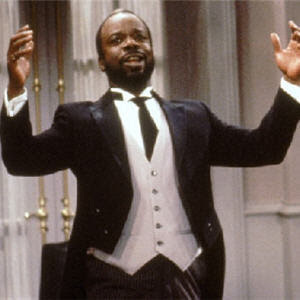 Then comes Geoffrey Barbara Butler (played by Joseph Marcell), the family's cynical English butler. The last main character is Jazz (played by Jeffrey A. Townes), Will's ill-mannered and a bit simple best friend. And now the plot summary: as the theme song tells it, Will, an African-American teenager from West Philadelphia, got caught in a little fight with some up to no good guys. His mother got scared and thus sent him in Bel-Air (L.A., California) to his uncle and aunt (the Banks family) hoping that the posh environment will help him becoming responsible, mature and respectful. However, Will is planning to become the “Fresh Prince of Bel-Air” and shatter his new entourage as you could say... The comic effect in most of the episodes is created by the social difference expressed in the language used by Will and his rich family and the contrasting attitude of everyone. The series has really pushed only one actor; Will Smith of course. No need to mention his whole filmography, you probably know most of it. What concerns the other actors, most of them played in TV shows, which stayed unknown in Europe, or had only a token role in series like “In the House” or “Melrose Place”. Actually Alfonso Ribeiro (aka Carlton), who became a filmmaker, is the one who had most success, apart from Will. As for Jazz, he returned to music and created his own record label.